Mr. Sharma is a senior citizen and a seasoned banker, just got retired from a leading nationalised bank. Both his sons are educated, working in IT companies, and travelling across the globe on onsite projects. Having discharged their responsibility of educating and marrying their children, he and his wife now feel alone and are intent to spending their sunset years in a secure and peaceful environment, and in the company of like minded senior citizens. With the advent of globalisation and a rising mobility of employees, increasing life expectancy & slowly disappearing joint family system, there is a marked trend whereby children move out of the nests and settle in bigger cities or out of India and parents are left with a choice to either travel with their children wherever they go or stay alone in the native place, for the rest of their sunset years. While with the advent of various telecommunications options, staying in touch has become lot easier, at the same time, decreasing physical capabilities to do day to day work and rising crimes are forcing senior citizens to evaluate assisted living as an option. Do you really need a retirement home? After living for decades in the same house or vicinity, it is very natural to get attached to it. But at the same time, if you realise and acknowledge your limitation and necessity in terms of assisted living and companionship, then a shift to retirement homes can come with a short term emotional pain but can prove to be a better option in the long term. Will you be able to maintain your current home without any hassles? Do you feel secure living alone? Are there security checks around your place like CCTV, intercom, 24 hours security etc.? Do you feel comfortable moving in and out of the house, driving etc.? In case of an emergency, are decent medical facilities available & someone is there who you can call for help? How is the present health of yourself and spouse? By what degree is it likely to worsen over time? First, you need to discuss this option frankly with your children and your friends, then do a due diligence on the facilities offered by various providers, speak to residents and only if you are convinced, take the final decision. Emergency facilities like CCTV, security guard, security alarm, intercom facility, etc. Activity centre like tennis, swimming, gym, spa, library/ reading room, etc. Bonding activities like a common dining area, celebration of festivals, birthdays, anniversaries etc. If you go on the website of individual providers, each provider promises its own set of features. Hence, be prepared to spend good time doing comparison shopping. But before moving out, first list down your expectations from a retirement home and break those needs into “must have” and “good to have” ones. After that, it’s time to screen the properties for the “must have” parameters and eliminate properties that do not meet your critical needs. For the remaining ones, you can shortlisted them and move forward. It is highly recommended to visit the place for a first hand view and which can also help you get an independent feedback from the actual residents as to whether the facilities promised on paper do exist and working properly. Apart from features and benefits, buying a retirement home involves a financial commitment and a decision on which is the best amongst the various available options (outright buy/ deferred buy/ long term lease/ monthly rentals) – at this stage, you need to have a clear understanding of the various terms and conditions and since you might have to also liquidate some of your retirement corpus to meet this commitment, you must involve a trusted financial planner at this point who will provide you with the right guidance and advice on this issue. Moving into a retirement home is not easy for any senior couple. It is in these times that as children, friends and even trusted financial advisors, we need to make the transition as smooth as possible through a proper hand-holding, support and reassurance, knowing that this is the right solution for the long term well being of the couple. As for Mr. Sharma and his wife, it took some time for them to adjust with new surroundings, and make friends with the other residents, but the retirement home has proved to be the best gift by their children. Now, in a span of few months, Mr. Sharma has reconnected with his lost passion for tennis while his wife has developed long lasting friendships with other ladies sharing the similar interest for gardening and cooking. As for their children, wherever they are in the world, they can rest assured of the overall well being of their parents. As a part of the financial planning process I was analysing some financial facts of my client. He, a salaried executive, worked hard and made it to senior corporate ranks in 17 years of his career. Like many others in National Capital Region, he too resorted to adding multiple properties to his investment portfolio. He loves funding his real estate investments the EMI-way i.e. buy a property with borrowed capital and keep paying back via monthly instalments for over a decade. He loves the fact that in real estate there is so little volatility to deal with, tax advantages and the convenience of paying back the borrower in a systematic way. He is uncomfortable with direct equity and is reluctant to take the mutual fund route either, given their lacklustre performance in last 5 years. You, as a tax payer, get a deduction towards interest up to Rs. 1.50 Lacs on loan for a self-occupied property per FY. You get to deduct even the principal (upto Rs 1 Lac) under Section 80(C) for a self-occupied property. If you have a second house and if it is a let-out property, you can deduct the full interest (NO LIMIT!) from your rental-income.You also get to claim deduction towards municipal taxes paid during the relevant FY and a flat deduction of 30% of the annual value towards repairs. The loss, if any, from the house property after considering the aforesaid deductions can be offset against income in any other head of the current FY. In other business you can deduct interest against income made from that business and not against your salary or income from capital gains. In short-term trading of shares, any losses made can’t be used to offset your salary. But for the loss from house property, such is not the case. The loss, if any, which cannot be set off against the current FY’s income can be carried forward to subsequent FYs subject to a maximum of eight FY’s for set off against the income from house property of subsequent FYs. Capital gains that you make when selling the house can be exempted from tax by buying another house if they are long term capital gains. If you make capital gains by selling other capital assets like shares, government bonds,and/or gold, you can buy a residential property with the sale proceeds and need not pay the tax on your capital gains if they are long term capital gains. Any property which is given out on rent for a minimum period of 300 days in the previous year is not considered as an asset. Such a property i.e. let out for 300 or more days, is excluded from net wealth and not subject to wealth tax as per the prescribed provisions of the wealth tax law. The list can go on but writing in detail about the tax advantages is out of scope for this article. Coming back to my client, as an investor, he has properties in Mumbai, Pune and Gurgaon. Given his diversification (to mitigate risk) and the weak story of Indian capital markets since the fall in 2008, he felt proud of having taken a skewed asset allocation (real estate to 85%), and made wealth impressively. While he has been doing well, he still felt the need to rope in a financial planner to review his investment strategy. And there I was to assess his financial life. I noted that while he had no loans on the properties that he had rented out, he did take a good amount of loan on the property that he lived in. While he was using the deduction u/s 24(b) for his self-occupied house but he was not aware of using it to his advantage for properties that he had rented out. I took it as an opportunity to educate him on financial leverage, tax advantages of the housing sector, and income offset by any loss from the house property (given that he belonged to a high income bracket of professionals). Let’s say you buy a house for Rs 1 Crore, where 50 Lacs is funded by you and the balance 50 Lacs is a borrowed capital (20 year loan at 10.50% per annum reducing monthly, EMI Rs. 49919). Assume the house has been rented out earning you a monthly rent of Rs. 25000. Also assume the value of house is increasing at the rate of 10% per annum (which is far less than what the returns have been in last 5 years given Pune, Mumbai or Gurgaon residential real estate market). If you avail deductions u/s 24(a) and 24(b), the loss from house property shall be (Rs 3, 20,081). Refer table below for a detailed calculation. The loss, if any, from the house property after considering the aforesaid deductions can be offset against income in any other head of the current FY. The loss, if any, which cannot be set off against the current FY’s income can be carried forward to subsequent FYs subject to a maximum of eight FY’s for set off against the income from house property of subsequent FYs. For someone who is in the 30% tax bracket, the loss from house property every year until 2020 (as per the table above) is a huge advantage. See Table 1above for Income tax saved every year by the loss from house property that offsets his annual income. Wikipedia states that leverage in finance is “a general term for any technique to multiply gains and losses. Common ways to attain leverage are borrowing money, buying fixed assets and using derivatives.” In the scenario above, an individual borrowing 50% of the required capital to acquire a house (that is increasing in its asset value) is financial leverage. Using the tax exemptions for interest paid on a rent out property is another form of leverage. If you look at the incremental value created every year by taking the leverage (i.e. borrowed capital of 50 Lacs on an appreciating asset and the tax exemptions on interest paid) you would notice the impact in the growth of the net asset value of the house (See Table 2). If instead of investing 50 Lacs in a house, they were invested stand-alone in equity mutual funds, assuming 10% rate of return, compounding annually, the wealth creation graph would be as in Figure 3. So, if my client has invested in property in last 10 years and earned steady yields besides capital appreciation, I have no reason to not appreciate him for his decisions taken. However, I have taken this as an opportunity to educate him on financial leverage to build wealth and the shortcomings of having a portfolio that is predominantly real estate. It’s not ideal to have the investible surplus allocated to real estate in a high proportion. To know why please read Manish Jain’s article Don’t place all your Eggs in the Property basket. On 31 October 2012, the Income Tax Appellate Tribunal (ITAT) delivered an order that is set to bring an unexpected relief to millions of home buyers in the country. It clarified that the interest paid on home loans is an expense to the home buyers and hence is to be counted as a cost to them. Thus, when they sell the house, the capital gains on its sale will be the sale price less the purchase cost and all the interest that they paid on its home loan, if availed of. So far, capital gains on the sale of a house were its sale price less the purchase price. The only relief available was for LTCG (long-term capital gains) (ie, if the house was held for at least 3 years after its possession) where the cost of purchase and its improvement could be indexed to the CII (Cost Inflation Index). For short term capital gains, no indexation relief could be availed of. As far as the interest on housing loan was concerned, its advantage was available under Income Tax Section 24(b) where yearly relief of Rs 30,000 or 1.5 Lakhs for self-occupied property, and interest paid less the rent for rented out property was available. There was no relief available on capital gains for the interest paid. The case under consideration of the tribunal was of a tax payer C Ramabrahmam, who borrowed money for buying a house property. He claimed deduction for the home loan interest paid while computing income from house property. When he sold the house, he also treated the interest paid as his ‘cost of acquisition’ of the house and claimed deduction there too. The income Tax assessing officer disallowed it. Matter went to the first appellate authority, Commissioner (Appeal), who allowed the claim of the taxpayer. Income Tax department appealed but even the ITAT has now sided with the tax payer holding that deduction under IT Section 24(b) deals with house property while the capital gains IT Section 48 deals with only the gains and the two can co-exist separately since they are covered under different heads of the income. To illustrate the effect of this ruling, consider the case of a person X who buys a house for Rs 30 Lakhs in 1997, takes a home loan of Rs 24 Lakhs (80% of value) paying an EMI of Rs 23,672 for 15 years at average 9% per annum interest rate. The total interest outgo is about Rs 18.6 Lakhs over 15 years. Let’s say he sells it for Rs 1.87 crores in 2012 (taking a good 13% per annum appreciation). Using normal method of indexation, his cost of acquisition comes to Rs 73.77 Lakhs, capital gains is Rs 1.13 Crores and he pays a tax of Rs 35 Lakhs on it if he is in 30% tax bracket. However, if the ITAT judgement delivered now stands, his cost of acquisition (counting indexed payment of interest also) would be Rs 1.12 Crores, capital gains would be Rs 74.6 Lakhs and he would have to pay a tax of only Rs 23 Lakhs. Thus, he saves tax to the extent of Rs 12 Lakhs, ie a saving of about 35% of tax. Now the question uppermost in everybody’s mind should be – will this ruling by the ITAT go unchallenged by the Income Tax department, given the large revenue loss that the Govt is likely to face. It is very unlikely that the Govt will let the matters lie at this point. The course open to Income Tax Department now is to go to the higher courts – first High Court, then Supreme Court and if even then there is no favourable ruling, a change in Income Tax Act itself should not be ruled out. What if anybody files his Income Tax Return as per new ruling in the intervening period? It will have to be allowed by the Income Tax assessing officer but chances of it being rolled back are also equally high if the Income Tax department gets a favourable ruling at any stage. Another pertinent point is – will the interest paid at different points of time be allowed to be indexed? In case the interest is allowed as a cost as per the recent ruling, to my mind, there should be no dispute that indexation will have be allowed in the interest cost, as it is allowed currently in the cost of improvement or renovation of the house property. In September this year, I met Deepak and Saloni – a DINK (double income, no kids) couple – who wanted my financial planning services. This young couple earned well, but had parked all their investments in one asset class – property. They had a portfolio of five houses, a term plan, a mutual funds portfolio worth a few thousands and some shares. We started discussions 0n financial planning. By the time I visited them again – in October – they had added one more property to their list. I had another interaction with a couple in their forties with a similar story – they too had parked all their investments in property. Four, to be precise. The rest of their money lay in their savings account. We have been taught to ‘invest in property and LIC policies, as their value never goes down and will always fetch you positive returns’. In the cases I have listed above, and plenty more, property is only investment asset class. There seems to be a craze for buying property so much so that we tend to lose focus on all other forms of investments. This has been further ‘confirmed’ by the boom in real estate over the past 7-8 years. The biggest disadvantage with real estate is that it is an illiquid investment. You need to spend on its maintenance and also pay taxes and duties. Speculation is rampant in the real estate industry. These speculators make lump-sum purchases during a boom, without bothering about the purchasing cost and the ongoing costs such as maintenance. Now, I am not implying that real estate is a bad instrument for investment. But it becomes dangerous when it is the only asset class that one invests in. Here, of course, I should mention that the ‘first house’ (which is bought for the purpose of residence) is not being included assuming that it is not for resale. With the ‘pressure’ created by real estate brokers and builders that the rates are going up every day, lay investors fall for the trap, thinking that it is now or never. With property prices sky-rocketing across urban and semi-urban areas, larger chunks of money are required to fund even the down-payment. For a salaried person, this may not always be easy. A number of investors fall for the “initial payment of 10 percent only” trap. Without even calculating how they will service the balance down payment and subsequent equated monthly instalments (EMIs), people rush in in the hope of making a quick buck. They often sell-off the booking when the second instalment becomes due. This is a gamble which could go seriously wrong. 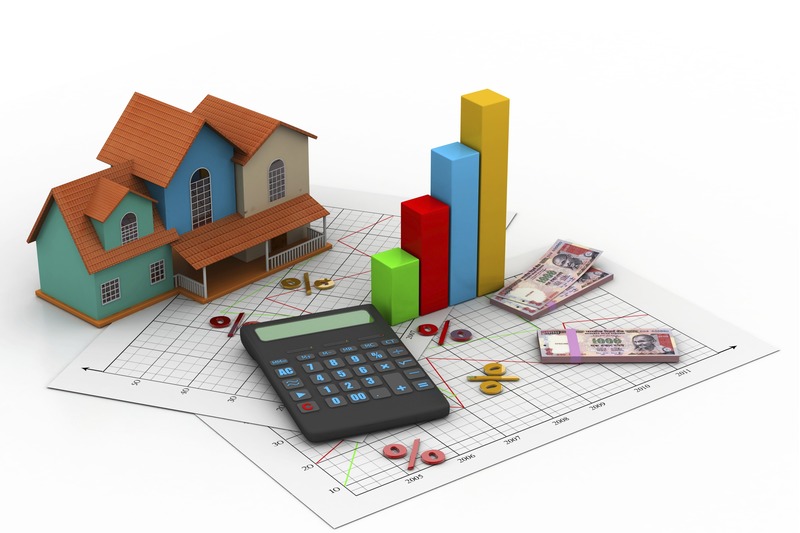 With financial planning and proper management, you can own your dream house. Illiquid asset: Since it is an illiquid asset, it can have serious repercussions in case there is an emergency. Lack of liquidity can lead to a distress sale. If there is a medical emergency and you require a few lakh rupees, you would have no choice but to sell off the house (which could be worth much more) to fund that immediate requirement. Property prices can fall: We have an innate ‘belief’ that the prices of property only go up. This is a generalised statement. It could always happen that the area / locality / city where you have purchased your property may not grow due to certain factors, beyond your control. Long-term returns may not be the best: Another strong notion that we carry is that property gives the best returns in the long term. Now this is true depending on your definition of ‘long-term’. If in your definition, long-term is 3-5 years, then you may be right. But it has been seen that over 25-30 year periods, equities have delivered the best returns. There are studies to prove this. Can affect your goals: Financial planning through property alone is like putting all your eggs in one basket. It can affect meeting your goals since there may not be a buyer when you wish to sell, at the time of your goal. One should have a robust, diversified and liquid portfolio, to ensure sufficient liquidity before ‘investing’ in property. People should carefully plan their investments to meet their goals in an organised and structured manner with due importance to asset allocation. Putting all the eggs in to one basket could lead to severe consequences.